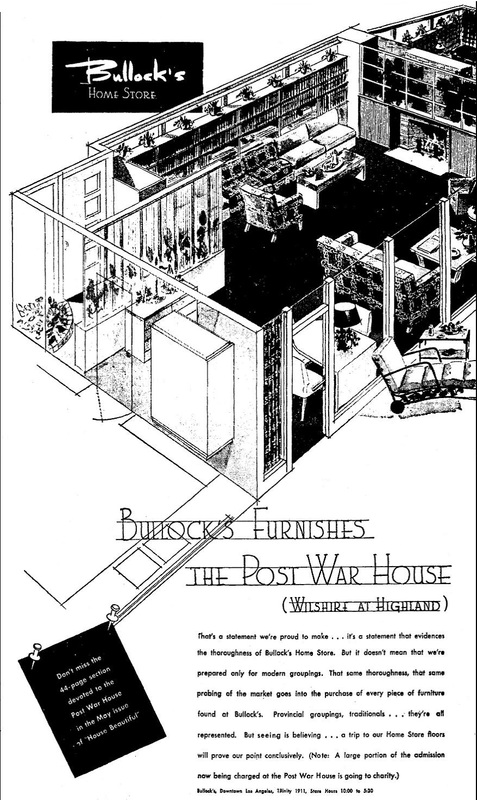 With the war’s end, Burns teamed up with industrialist Henry Kaiser to build affordable Kaiser Community Homes around Los Angeles. 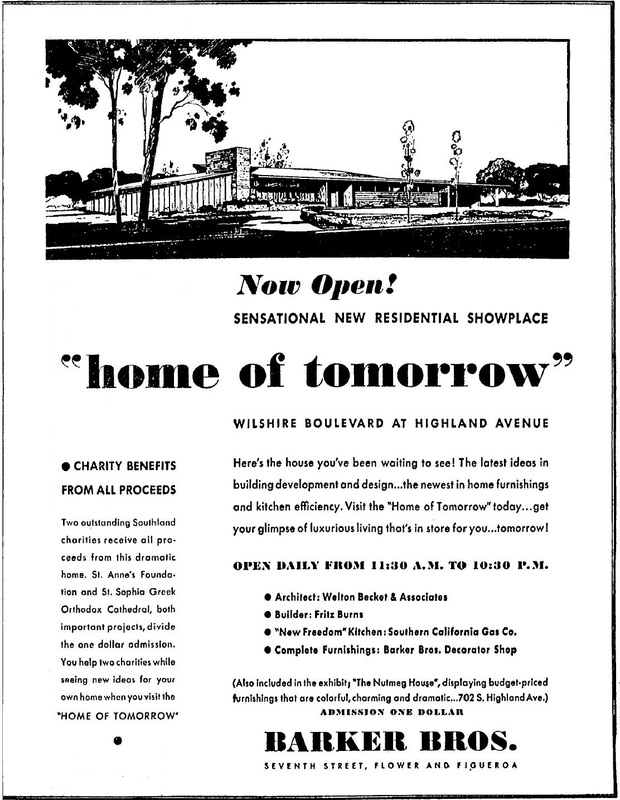 Also thinking of those new innovations and equipment, he commissioned architects Walter Wurdeman and Welton Becket to design a model demonstration home at the intersection of Wilshire and Highland. 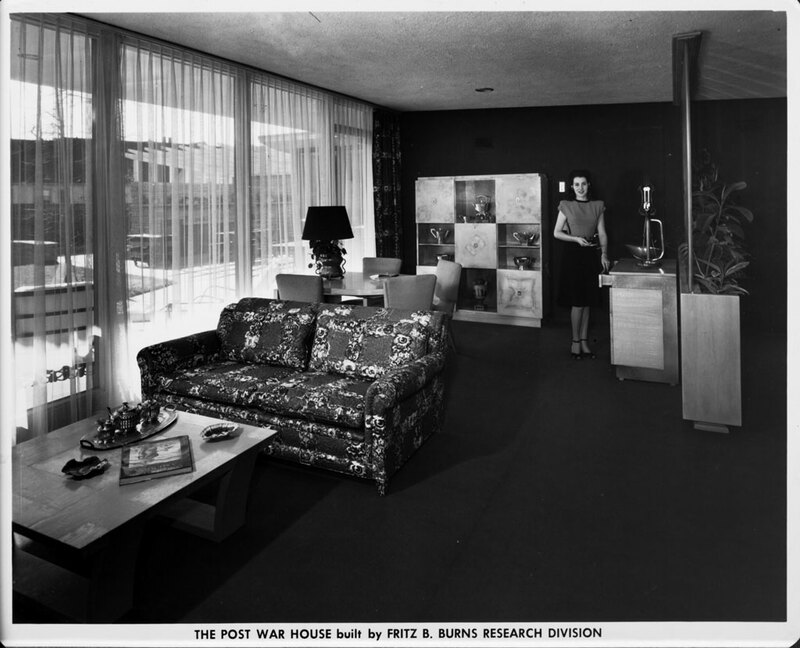 The promotional booklet for the Postwar House. The showcase house opened to the public for tours in March 1946, with tickets sales going to charity. Hundreds filed through the two bedroom, two bath showplace, which was oriented toward the backyard patio and garden for maximum privacy. The combination living and dining rooms featured sliding glass doors for a “wall of glass” effect. 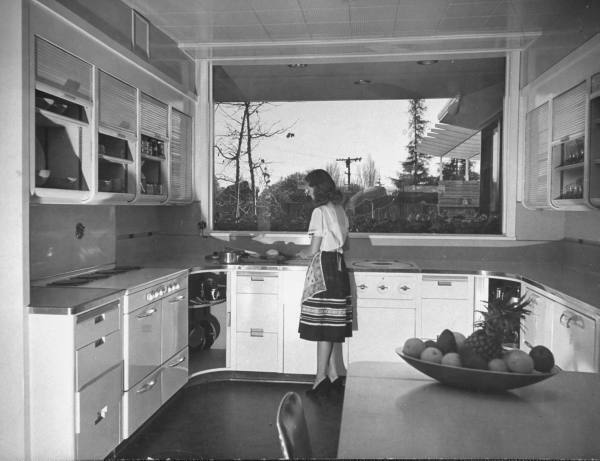 The innovative features on display included a “nerve center” control board from which the housewife could turn on the lawn and garden sprinklers, raise the garage door, and turn on her radio, an intercom, a hydraulic dish washer, radio entertainment is available in every room, two high-fidelity receivers behind sliding panels next to the fireplace along with recording equipment, an automatic record player, and a built-in television receiver, electric toothbrushes in the bathroom, and ultraviolet rays to keep the medicine chests sterile. An electronic system, The Precipitron, supposedly kept the air clear of all dirt, making dusting a thing of the past. It had a carport rather than a garage and a built-in bar-b-q/outdoor kitchen. 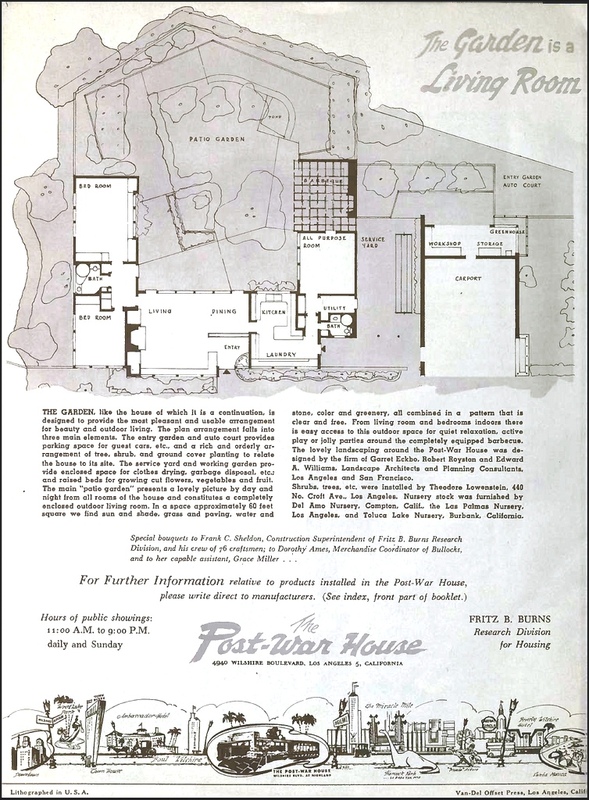 Floorplan of the Postwar House from the promotional booklet, 1946. A view of the front of the house. LAPL. View from the back garden, looking out toward Wilshire Boulevard. USC. Another view of the living room and front entry. USC. 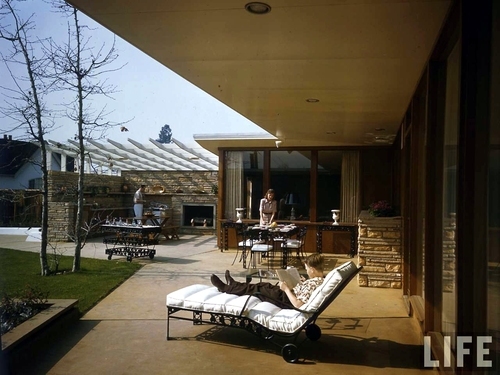 Bullock’s furnished the Postwar House. Items could be purchased in the store, though not always right away (see below). They would do the same for the “Blandings Dream House” in 1948. 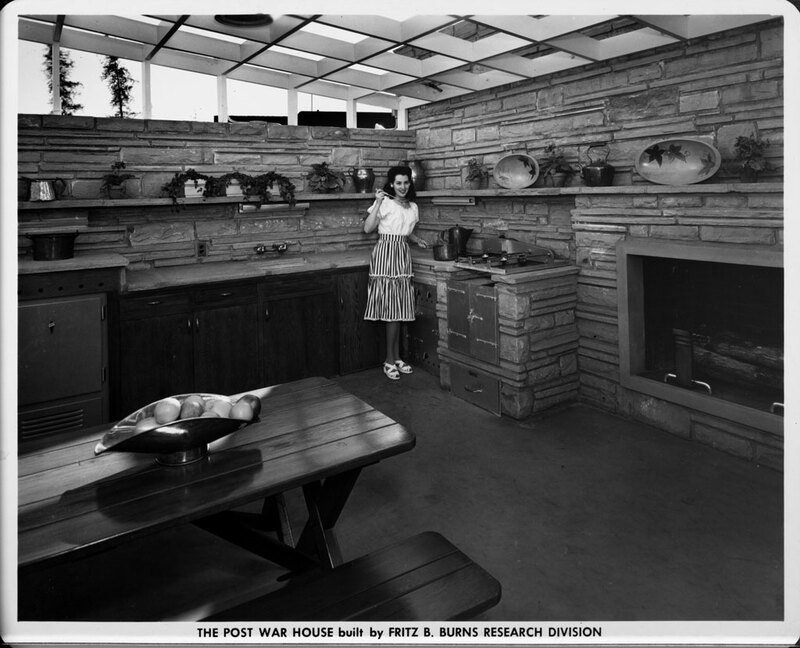 Local manufacturer Western Stove Co. provided the Western-Holly range for the Postwar House kitchen. Customers could get one of their own, but not until 1947. 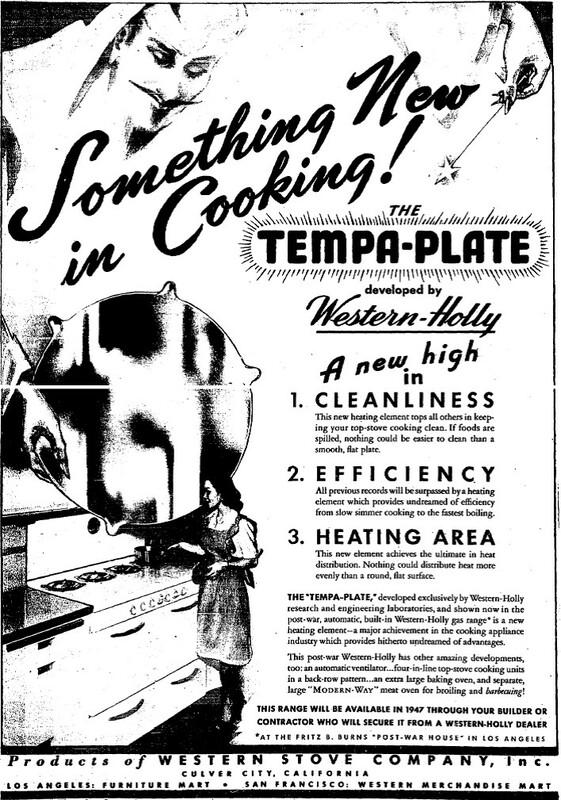 Western Stove also equipped the “Blandings Dream House” kitchen in 1948. 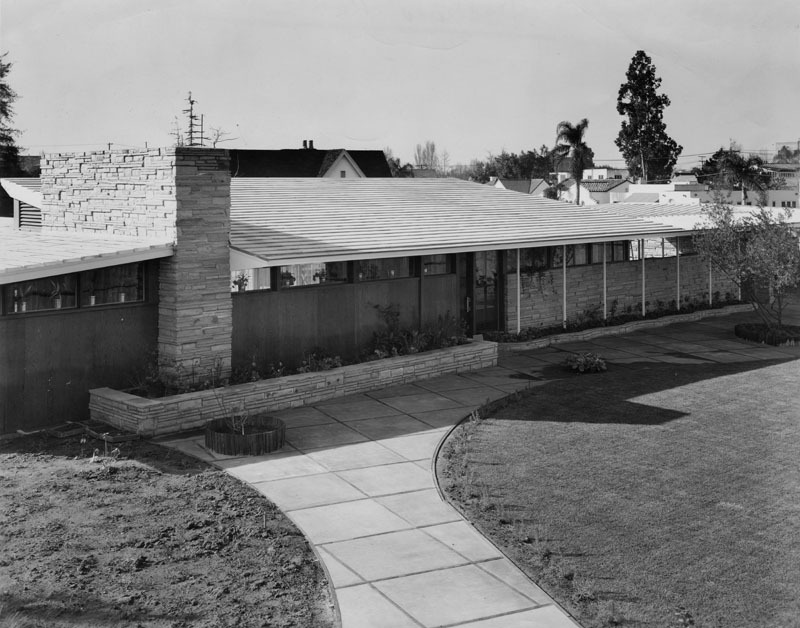 House Beautiful sat up and took notice, devoting considerable coverage to the Postwar House in its May 1946 issue. 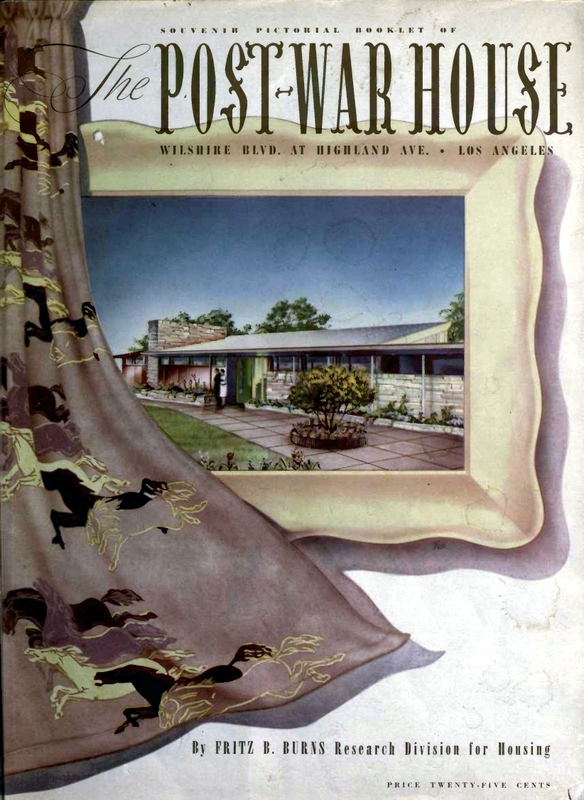 Cover of House Beautiful, May 1946. 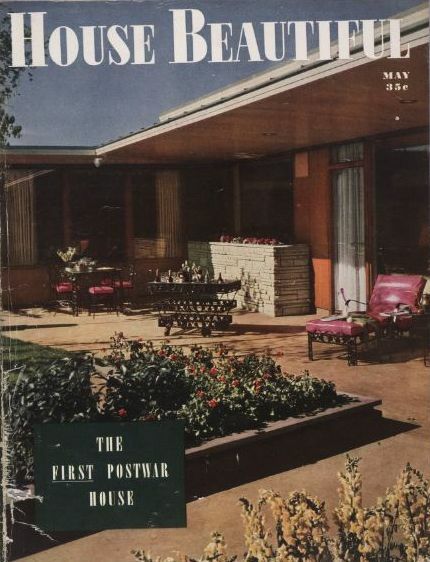 Life magazine covered the house as well in the May 6, 1946 issue. The master bedroom. Life, 1946. The back patio ran the length of the house. Life, 1946. 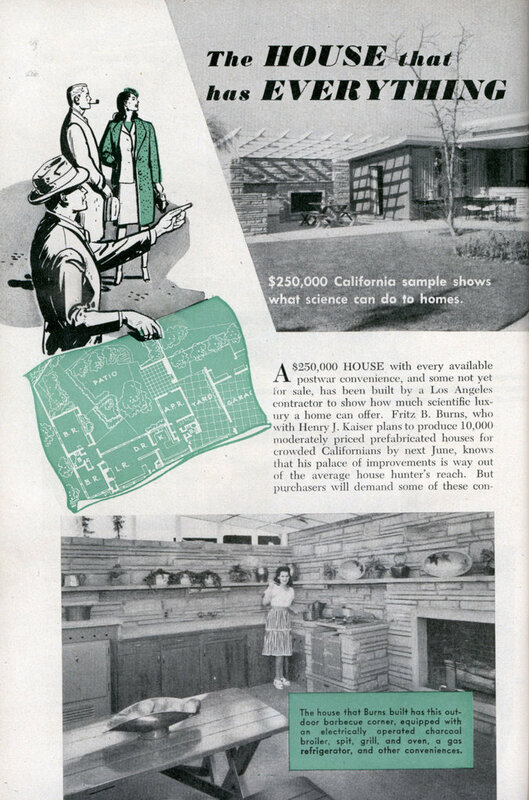 Popular Science magazine featured the Postwar House in July 1946. “The House that has everything” Popular Science July 1946. It wasn’t Burns’ intention that people run out and copy every feature of the house; rather it was meant to showcase all that was possible in the new era. “Mr. and Mrs.” desk from Bullocks as seen in the Postwar House’s boys bedroom. “Yes, we have it at last.” Furniture manufacturers were affected by lumber shortages, too. As a result, things weren’t always available right away. 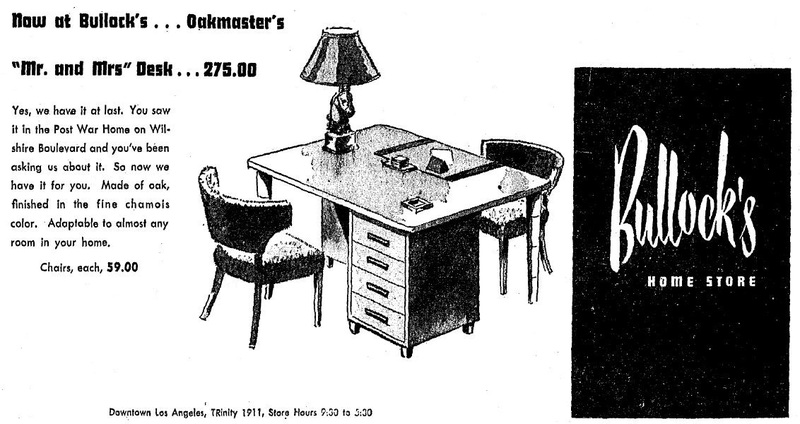 The clever desk, which retailed for $275.00, was advertised in May 1947, more than a year after the model home first opened. 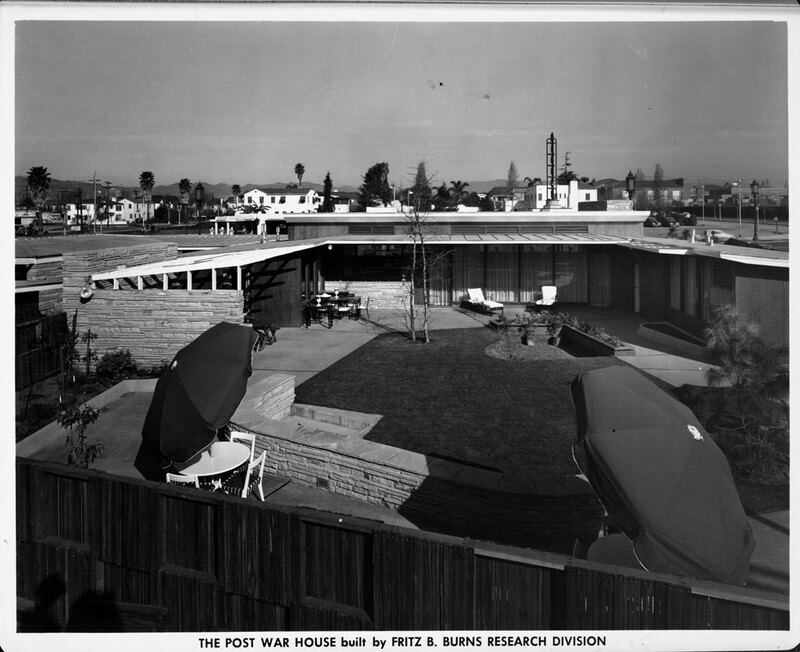 Eventually, all of Los Angeles who wished to see the Postwar House had done so, and Burns renovated it, incorporating new ideas, as The House of Tomorrow. 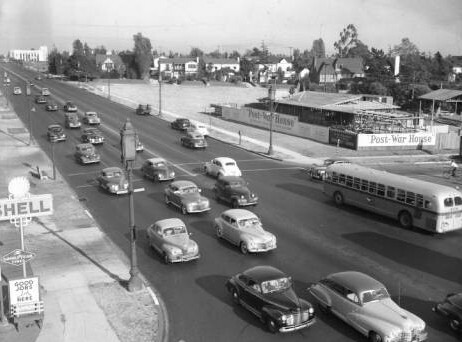 It opened for tours in March 1951. 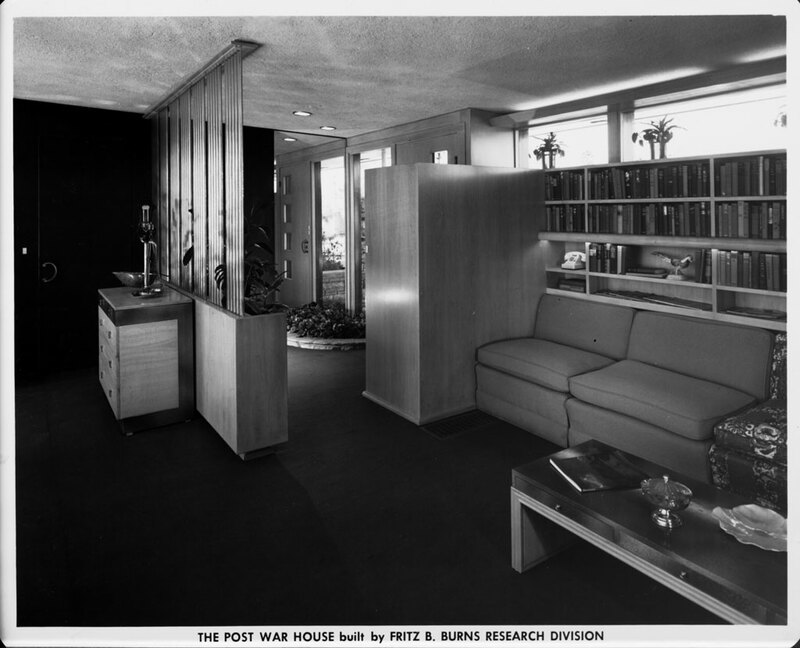 The Postwar House becomes the “Home of Tomorrow” with furnishings outfitted by Barker Brothers this time. 3-21-1951.